Please fix the comments feed icon. Currently, if a WordPress or WordPress.com users chooses to showcase their feed links on their WordPress blog, it shows the same RSS symbol for both feeds: posts and comments. If the user chooses to only show the icon, there is nothing to inform the reader that there is a difference between the two feeds. While we can choose to use the icon and text, why force us to clutter up simple common icons with both. 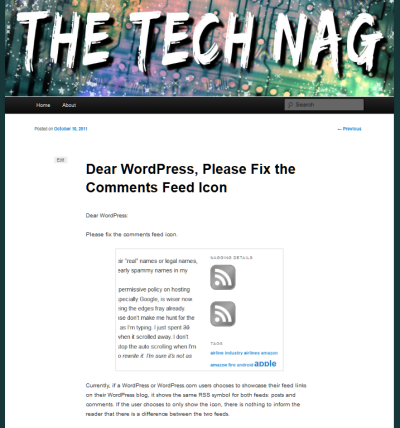 Please change the comments feed icon to indicate it’s the feed for comments on the blog. I’ve included an example to inspire you, but I know Matt Thomas or the WordPress Community can come up with something more stylized. 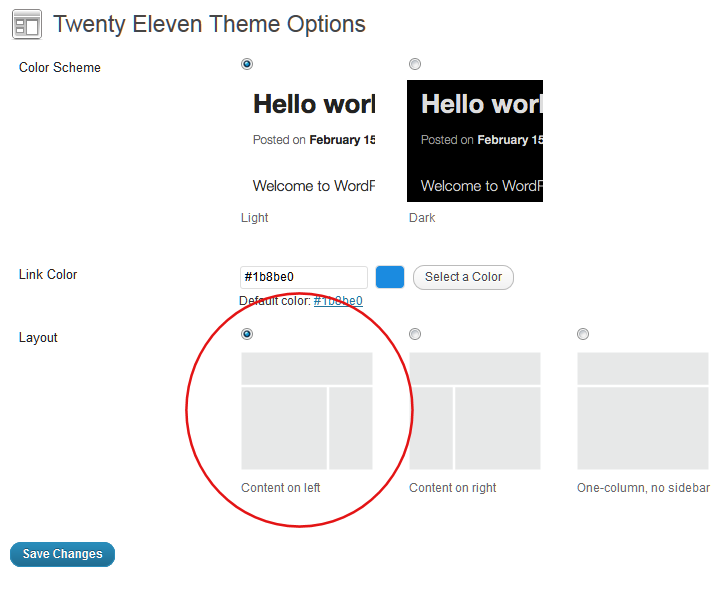 While I love what you are doing with your new annual default WordPress Themes, and love the features of 2011, please don’t mislead us regarding the layout. Previewing a post, The sidebar was gone! I felt naked and exposed with no where to go from the post I was viewing. I was frightened, worried for my three readers and my mother visiting the site and getting lost without a clear way to navigate around to all the goodness I’m sharing here. On the Appearance > Theme Options, I can choose the design layout I want. Left sidebar, right sidebar, or no sidebar. I clicked VERY hard on right and left sidebar options and I still see only the single post with no sidebar on my posts. If I choose a layout style, I expect it is the same for every page on my blog, not just the front page. That doesn’t make sense. Maybe it’s broken in the Theme. I’ll except that excuse. Please fix it. PS: I’m starting to have nightmares of the original Default/Kubrick WordPress Theme, so please fix this.